Millions of people will be converging this weekend on the narrow band of darkness where the sun will be in total eclipse next Monday. But if you’re in the Bay Area, you don’t have to miss out. You can walk out the door and see the 75 percent eclipse here (Just don't look directly at it without safety glasses!). There are also plenty of events for all ages and interests, from the big wingding at San Francisco’s Exploratorium, to a toddler story time at your local library. And even if you’re stuck in the office, you can watch the eclipse stream live on the Exploratorium app, Total Solar Eclipse. By the way, call ahead if you're hoping to pick up eclipse glasses from your local library. Supplies may be limited. The museum will open early for an all-out eclipse extravaganza. There will be telescopes and solar safety glasses on the Plaza for viewing, and astronomers and experts on hand to explain the science behind the eclipse. Exploratorium scientists in Madras, Oregon and Casper, Wyoming will offer live commentary via satellite on an indoor projection screen. The Oregon eclipse hits totality at 10:19 a.m. - around the same time the Bay Area reaches peak partial eclipse. “We’re thinking people can be outside here experiencing the maximum occultation, then they can have their apps open, and they can look at actual totality in Oregon while we’re experiencing peak here,” says spokesman Martin Rock. Then, he says, everyone can head inside to watch Casper’s totality, at 10:43, on the big screen. The museum will begin streaming a live sonification of the Casper eclipse at 9:15 in the Kanbar Forum. The Kronos Quartet will join the sonification live for 30 minutes starting at 10:29. The performance is sold out, but the broadcast and performance is available to stream live on the Total Solar Eclipse app. Expert astronomers and educators will bring the astronomical phenomenon to life. Watch the live feed from NASA and learn all about solar eclipses with hands-on demonstrations, and activities such as making pinhole viewers. 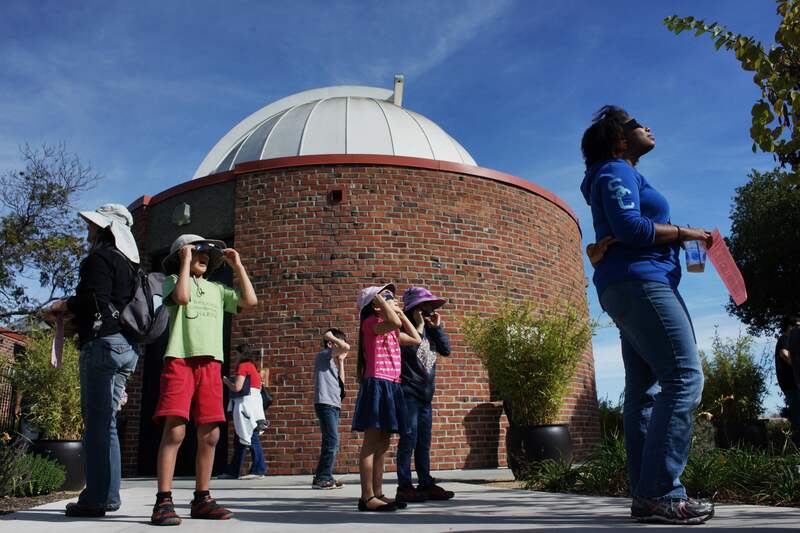 Outside on the observatory deck, watch the partial eclipse safely with a variety of viewing instruments, from Sunspotters to eclipse glasses to an historic 8-inch telescope. You may have to wait in line to look through it, but the eclipse is a pretty leisurely experience, he says, taking place over a couple of hours. The Ortega Branch Library will host a Toddler Tales storytime inside, with a break to head outside and see how the eclipse is progressing. The theme of the storytime will be sun, moon and space. Free eclipse glasses will be available. Eclipse glasses are available now for pickup at the library for Alameda residents. Join in for a viewing party at the library on the big day. If it’s foggy or cloudy, a live feed from NASA will be projected on a large screen in the Stafford Community Rooms. Unplug and head outside to watch the solar eclipse at community viewing events in Sacramento and San Francisco sponsored by state energy officials. There will be NASA representatives and scientists on hand and, from Energy Upgrade California, free eclipse viewing glasses that double as coffee sleeves. In Sacramento, there will be arts and crafts with the Powerhouse Science Center. Assemblymember Chris Holden in Sacramento and Mayor Edwin M. Lee in San Francisco will offer people tips on saving energy. 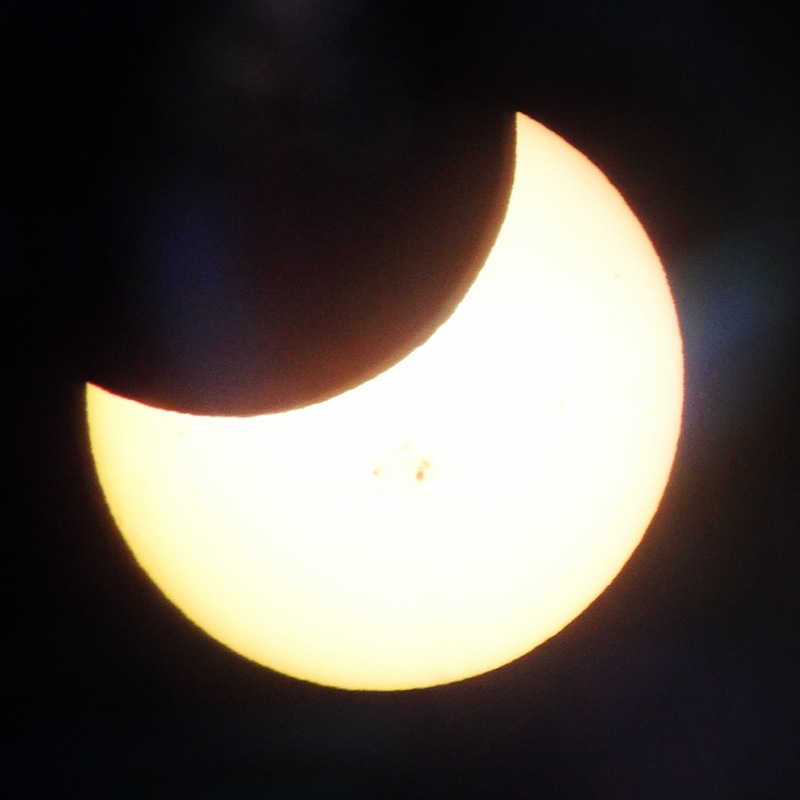 The Powerhouse Science Center and the Sacramento Valley Astronomical Society (SVAS) host a free public Solar Eclipse Celebration and viewing party on Powerhouse grounds. Bring your own eclipse glasses, because the center has sold out. Eclipse-themed planetarium shows with paid admission start at 11 a.m.
“Witnessing a rare astronomical event is fun, but to see it with others makes it even more exciting,” says librarian Kate Conn.
Conn says there will be pinhole viewers for everyone who shows up for a community viewing event on the day of the eclipse. Or you can pick up your free eclipse glasses ahead of time at any Oakland library location and watch from home. The library won’t be open, but there will be a viewing party in the parking lot and free eclipse glasses.